​If you're here, it probably means you are new to Carolina Dance Collaborative. We welcome you to our dance community and thank you for your interest in our dance program! We are so excited to begin another season of dance. We've even added some new classes so don't forget to check those out! You may be wondering; how do I register for classes? Do you have a studio where I can register? How do I pay? How do I register for classes? All registration is done online by clicking the "Enroll" page above. See step by step instructions for enrolling below. How do I pay? The most convenient way is to pay online through your Parent Portal. However, you may mail in cash/check to PO Box 5432 Greenville, SC 29606. If you choose to submit your payment via mail, LET US KNOW! 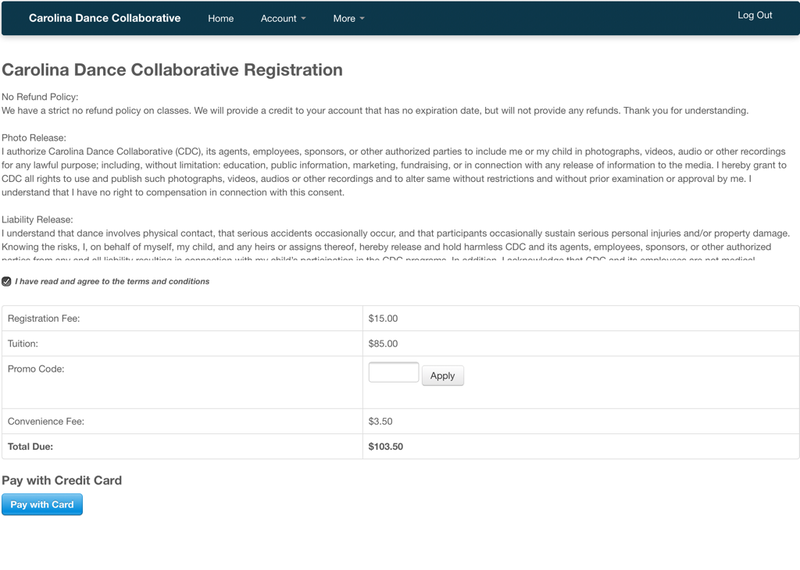 Your child is not actually on our roster unless payment is submitted online. If you send in a check let us know so we can complete your registration while we wait for your check to arrive in the mail. This is where you will fill in your information, whether you are a parent/guardian or an adult registering for one of our Adult or Senior Classes. The next step is to add a student by clicking "ADD STUDENT"
If you are enrolling in one of our Adult Programs, you will choose "I AM TAKING CLASS." By choosing this option, it will add you as a student. You will not be able to register for classes, if you are not a student. Before you create your account, please make sure you read over our policies as we do have a strict NO REFUND POLICY. 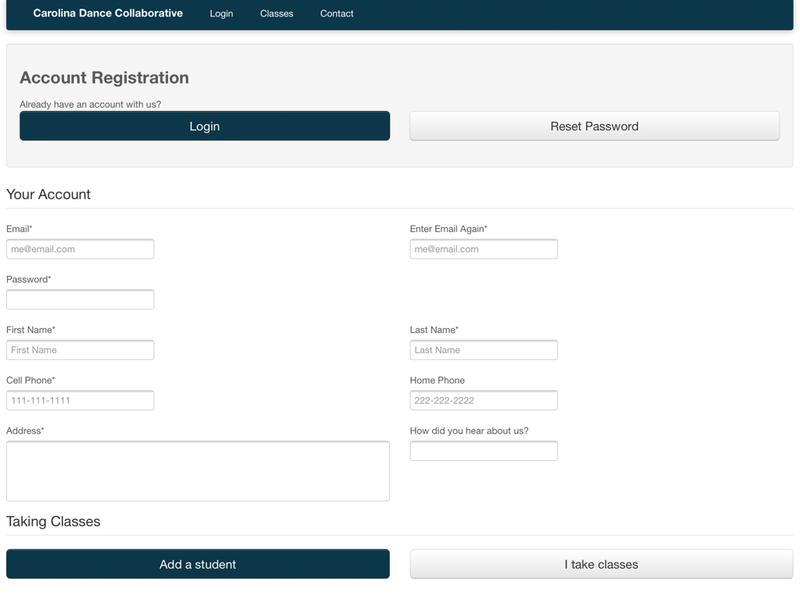 When you first create your account, you will automatically be navigated to the classes pages. 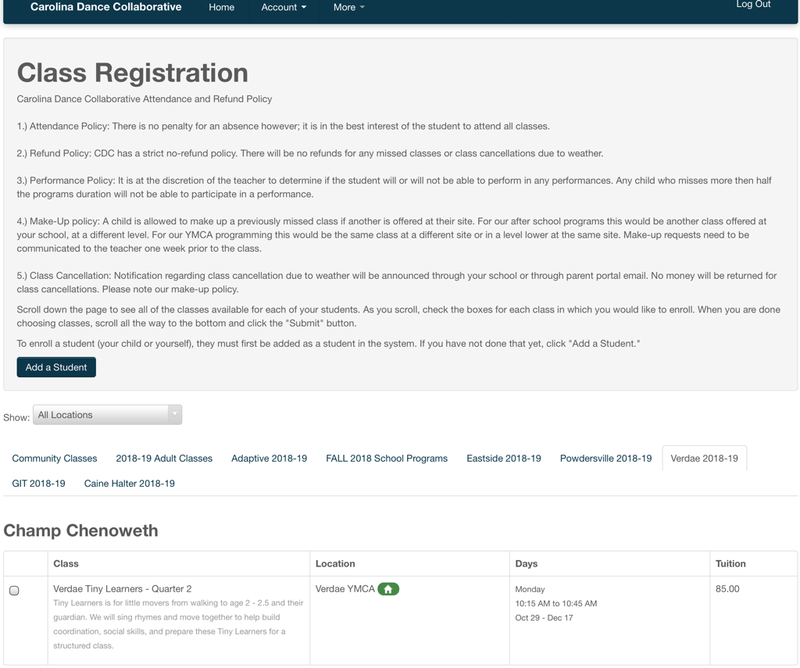 And, if you didn't read those policies before creating your account, don't worry, it will show you at the top of the classes page. ​Here you will find all of the YMCA locations, Adult Classes, Community Classes, Adaptive Classes, and After School Classes. Choose the location or program in which you are interested. After clicking on one of the tabs, it will list all of the classes available for your students age. Check the class you in which you wish to enroll. If you don't see the class listed, let us know. We would be happy to help! Once you check the class in which you wish to enroll, a FINISH REGISTRATION NOW button will appear at the top of the page. Notice, in red, it says that your choices are "saved, but you are not enrolled." Finally, submit your payment (or let us know you will be mailing in a check) and you are ready to DANCE! Still wondering what to wear to our YMCA classes? Check out our attire page or this post on how to prepare for class. ​Welcome to Carolina Dance Collaborative, or welcome back! In this blog post, I will be sharing with you some ways to prepare for class. Whether or not this is your first class with us, we thought it would be a good refresher for the start of Quarter 2 next week and to fill you in on why we think it's important to have all of the dance essentials ready for class. How should a dancer look for class? Dancers should have the proper attire for class (see your attire listed below). Dancers should have the proper shoes for class. As dance instructors, we not only want to teach our students dance skills, but also life skills. Some of those skills include; responsibility, preparedness, and etiquette. Here's how we hope our dances will learn those skills by being prepared for dance class. We ask for cap or long-sleeved leotards, because we get some dancers that like to pull down their leotard. :-) If you've already bought a spaghetti strapped leotard that's perfectly okay. Please don't feel the need to go out and buy a new leotard. If you would like, you can tie the ballet shoes in a knot and then cut off the extra string, this keeps them from playing with their strings during class. We ask that if you do have a skirt that it be attached to the leotard. This keeps the dancers from lifting their skirts to around their neck, twisting them around, or taking them on and off. These tights should be footed. This means that they should go over the foot. They make convertible tight so that they can come up over the foot. This is a good option for this age in case the instructor wants the dancers to be barefooted for an exercise, or to throw on those flip flops after class. If you would like, you can tie the ballet shoes in a knot and then cut off the extra string, this keeps them from having to tie their strings multiple times during class. We ask that their attired be fitted so that we can make sure they have proper technique and body placement. Where do I find all of this attire? 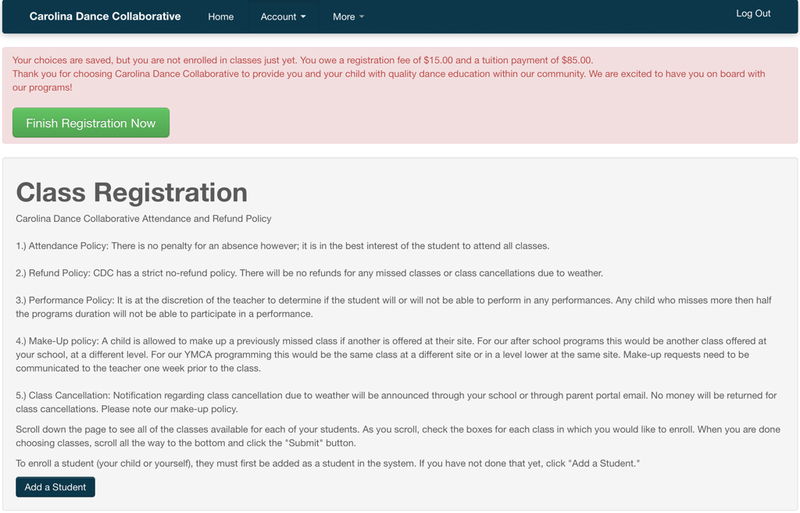 Welcome to the Carolina Dance Collaborative blog! Our blogs will range from event coverage, class information, ideas for practicing at home, and much more!